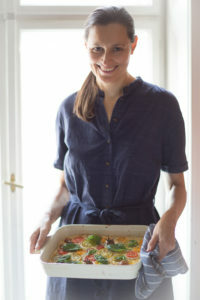 I thought I would explore some of the ways I approach cooking and where I get my ideas from. When I talk to my friends about food they often ask me “What are you going to cook today?” For me each and every day is different and I guess I am also and creature of habit. I like eating plain oat porridge almost every day. On the weekends when I have more time I’ll make some sort of savory option like tofu scramble or pancakes or a baked porridge. Other times what I cook is dictated by what my kids like or dislike at the moment. So recently my almost 15 year old son announced that he is not eating porridge anymore. I guess he had a porridge overdose and no enticing toppings a la chocolate nut spread or fresh fruit (delicious berries) could change his mind. So I had to get creative and it also had to be quick enough to prepare on a busy school morning when we leave the house at 7 a.m. So I started off making polenta which he still eats gladly but my other two who love porridge complained. Since I try to avoid eating bread. finding a quick option wasn’t so easy. 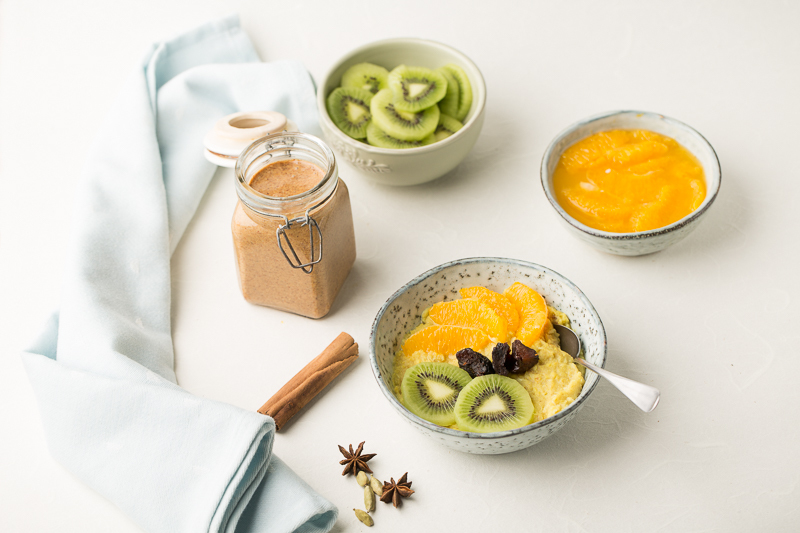 So one day I was at my local organic supermarket and I was looking at the various breakfast cereals and different flakes I noticed a series of different porridges from Power Porridge to Ayurveda Porridge and my curiosity was piqued. I looked at the list of ingredients and thought, “Hmm, this sounds good.” Needless to say I wanted to give my own version a go. I made a mental note of the ingredients and most of the ingredients I had at home and the others I bought. Millet flakes are not so uncommon and they are available with other flakes such as buckwheat, rye, barley and spelt. The other ingredients are also readily available and can be substituted with other flakes or dried fruit based on your own personal taste. After a few trial and error tests I came up with my own formula that has all the components that I like. The other advantage is that it cooks up in the same time as a regular oat porridge, about 5 minutes. So, overall there are many advantages to this porridge. 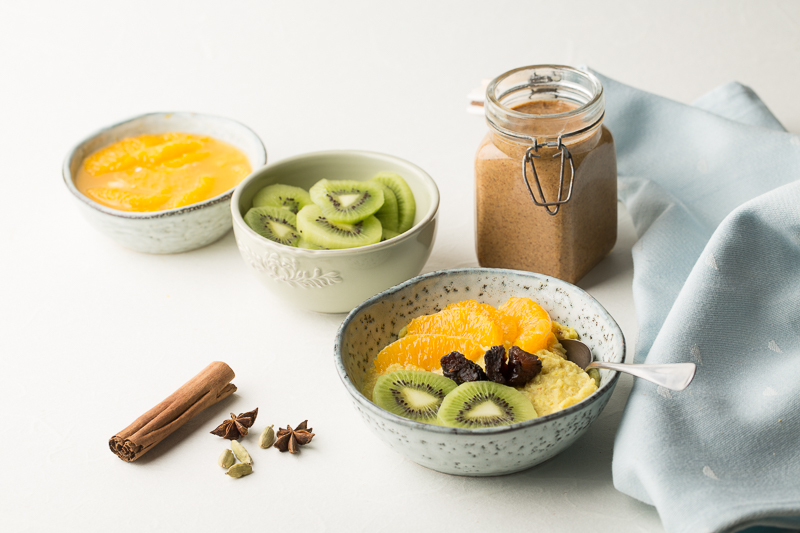 A word of warning for those who are following an Ayurvedic diet, this is not an authentic Ayurvedic recipe, just an interpretation of a porridge recipe from a store bought porridge from a popular German food brand (Rapunzel). I did some research and found out that in general an Ayurvedic diet begins by determining which dosha (type) predominates in you. I am most likely a Vata type and I should eat sweeter, and oilier foods than Pitta types who can eat more cooling foods. 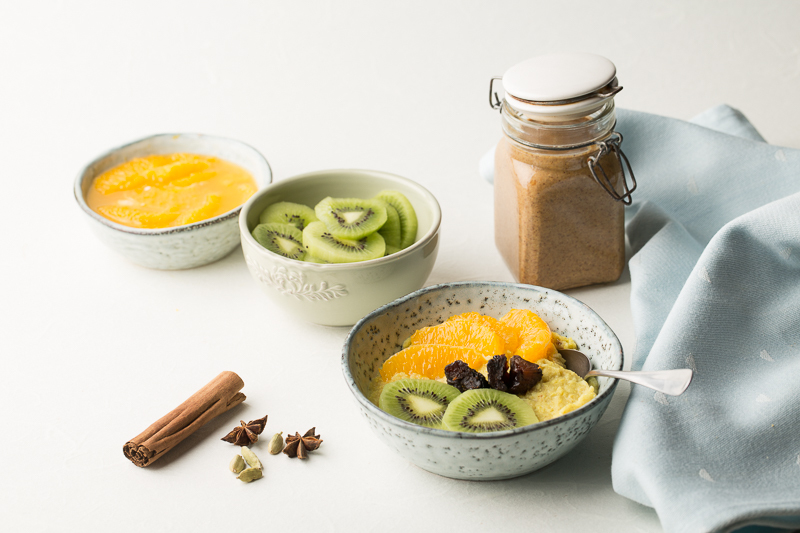 Ayurvedic breakfast porridges are usually prepared with stewed fruits and I prefer eating fresh fruits in the morning even during the winter, which is not recommended according to Ayurvedic tradition. 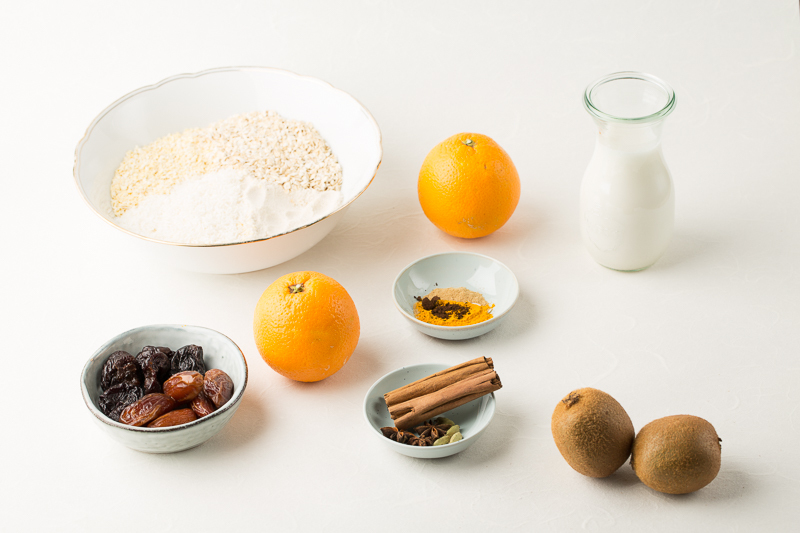 For those familiar with the principles of Traditional Chinese Medicine, there are are some elements that overlap and that includes the idea that in the winter the digestive fire Agni or Chi in Traditional Chinese Medicine need to be activated or protected and that is best done by consuming warming foods that are sweet and grounding. Another commonality is the idea of using all elements in one dish and in a particular order. Seeing that both teachings are ancient and are deeply rooted in both cultures I find them to be an endless source of inspiration about how to maintain and sustain ones health.These teachings put aside I mostly listen to my own body and am guided by my intuition in finding what works best for me. I don’t follow any diet rigidly. I use it as a source of inspiration and if I feel sluggish or unbalanced the first thing I look to is what I can change in my diet to improve my overall well-being. What I do find interesting though is the amount of information that is coming out increasingly about the negative aspects of consuming dairy products. I don’t know whether it was an intuitive choice or simply my taste buds but ever since I was a little girl I rejected all forms of dairy. The only exception was yoghurt and I guess the reason why I liked it so much was the tangy taste. Maybe my body was actively telling me to stay away from certain foods because it knew what I should avoid. Since eating is a very personal choice and we are influenced a lot by our upbringing it was sometimes difficult for me to avoid and I was trained over time to eat dairy products. Fast forward many years later and becoming vegan was in fact very easy for me especially when it came to abandoning dairy products. Place the milk and water into a medium sized pot and bring to a rolling boil. Reduce the temperature and add all the spices followed by the grains and dried fruit whisking continuously. The porridge will thicken very quickly. When it starts to stick to the bottom of the pot, remove from the stove top. 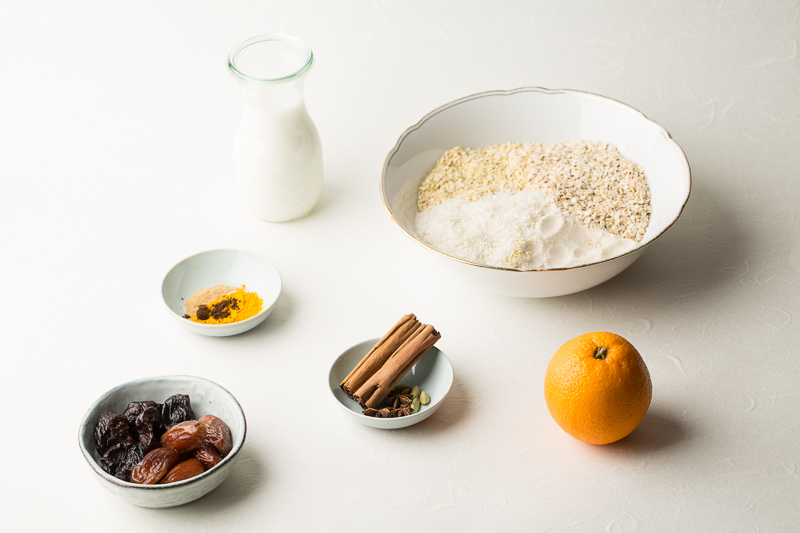 Serve the porridge and top with garnishes of your choice. I used kiwi, orange, dried plums and hazelnut butter.